Last week I received a very exciting parcel addressed to “Dexter’s Mum”. Most of my post consists of bills, bills and more bills so to be the receiver of a large fancy brown package put a huge smile on my face. I eagerly ripped open the parcel to find a few goodies for the boy wonder. 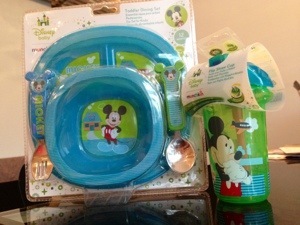 Those lovely people at Munchkin had sent us not only a Disney toddler dining set but also a matching flip straw cup. Instantly I knew Dex would be pleased with the contents as Mickey Mouse’s face was smiling back at me through the plastic wrapper. 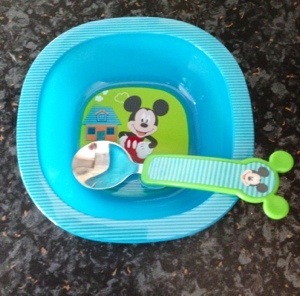 Part of the toddler dining set consists of a rather snazzy bowl with a clever square base. This helped Dex scoop up all of his cereal quite easily. The bowl also has a grippy base that worked a treat on even our glass dining table. 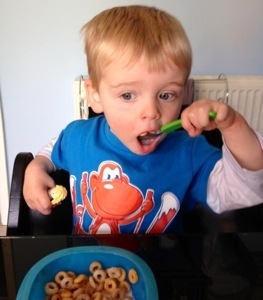 Dexter often chases the bowl around the table in the mornings with his spoon! The rest of the toddler dining set consists of a rather cute plate that is divided into 3 sections and a cutlery set. I’ve never really used a divided plate before; I’m more a shove it all on a plate/in a bowl kinda mum, but I really liked the idea of separating his food. 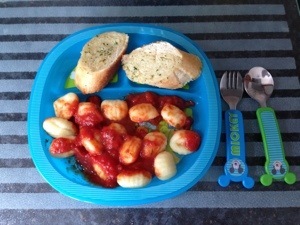 I dished him up fresh gnocchi with tomato and basil sauce for lunch, with a side of garlic bread (using the little portion sections, natch). The plate has the same grippy bottom as the bowl too, which again worked a treat on our table. 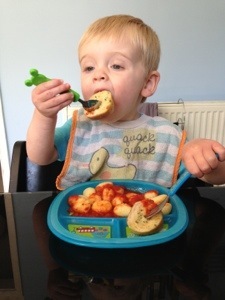 Dex seemed to enjoy experimenting with the sections and as you can see from the pictures the fork is the perfect size to pick up an entire slice of garlic bread. *sighs*. And the final part of our package was the quite fabulous Flip Straw Cup. Never one to get over-excited about a plastic object (yeah right), Dexter literally squealed with excitement when presented with said cup. He drinks very weak juice during the day but I often worry he doesn’t drink as much as he should. No need to worry it seems with this bad boy as he just loved sucking on the large straw and wouldn’t put it down. Once he’d worked out you didn’t need to tip it up to get the juice out he happily carried it around like it was this seasons must-have accessory. It even passed the “toddler with drink in the car” test. (This means my upholstery stayed dry in my car!) 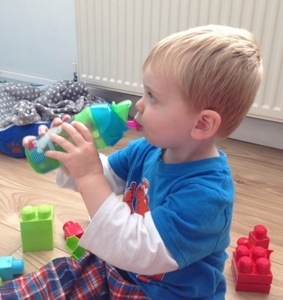 The cup has this clever lock thingy on it that means sticky little hands will struggle to open it. The cup is also good size to lug around in a changing bag. 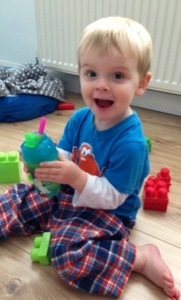 Now the geeky mum bit: all the items cleaned up brilliantly even the cup. You can completely pull it apart, straw and all to give it a good soak. Perfect. Feeding time is again fun. Thanks Munchkin. 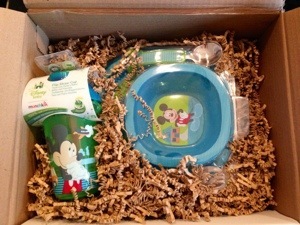 Disclaimer: Dexter and I were sent the Munchkin items to review and share my opinions about on my blog. Everything written above is my own rambling thoughts. With high quality print finishes, the Munchkin Disney range starts from £4.50. The Monsters and Minnie Mouse designs will be available from Babies’R’Us from February 2013, with the full range becoming available on Tesco.com/direct from March 2013. To see more of the fantastic Munchkin range and for full stockist details, please visit http://www.munchkin.com or like the Facebook page: MunchkinUK.